This study focuses on heterogeneous services and communication technologies for retrieving and sending information between students and lecturers in Malaysian higher educational institutes. It intends to investigate pattern and significant level of various services implementation, convergence of communication technologies and bandwidth capacity for last mile users (students and lecturers). It is designed to determine which communication technologies, services, bandwidth capacity and QoS will achieve the highest level acceptance in Malaysian higher educational institutes. Heterogeneous environment can also generate mobility approaches. 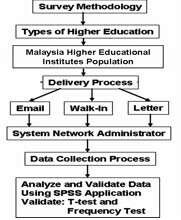 A survey method is used to collect data from respondents (System Network Administrator) in Malaysian higher educational institutes. Statistical Analysis using t-test shows that implementation of high speed bandwidth for Internet (WAN) achieved significant level. Frequency test are used to analyze the various services implementation via convergence of communication technologies in heterogeneous environment for retrieving information. The most apparent finding of this study is that various services implementation in higher educational institutes can affect convergence of communication technologies usage in accessing information over heterogeneous network environment between students and lecturers. The study or analysis confirms that Malaysia higher educational institutes have not achieved a maximum level of various services implementation via convergence of communication technologies between students and lecturers in heterogeneous network environment. 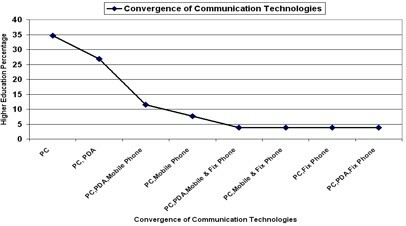 Therefore, low convergence of communication technologies can produce a low mobility and ubiquitous interaction between students and lectures in Malaysian higher educational institutes. The purpose of this study was to investigate current network infrastructure, implementation of various services and utilization of a variety communication technologies for retrieving and sending information to users (students and lecturers) over heterogeneous environment in Malaysia higher educational institutes. 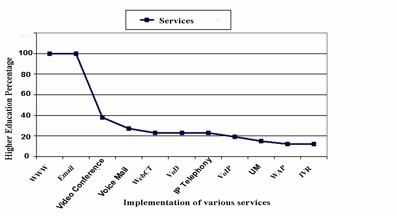 The study focuses on (i) types of communication technologies and services used for accessing information and interaction between students and lecturers; (ii) impact of current services and utilization of communication technologies over high speed bandwidth for computer network in Malaysia higher educational institutes; and (iii) Quality of Service (QoS). In this study, services refer to service-oriented architecture and communication between students and lecturers. The communication can involve either simple data transmission or it could involve two or more services. While, technologies are related to communication technologies that have been used by the last mile users (students and lecturers). The media includes digital broadcasting, integrated services digital networks, digital cellular networks, Local Area Network (LAN) and Wide Area Network (WAN) such as Internet, bulletin boards, modems, transmission media such as fibre optics, cellular phones and fax machines and digital transmission technologies for mobile space communication (the new low earth orbit satellite voice and data services). In addition, heterogeneous environment is related to implementation of various services such as WWW, Email, VoIP, IP Telephony, IVR, WAP, VoD, Video Conference and Unify Messaging that can be accessed via variety of communication devices such as PC, PDA, fixed and mobile phones over wired and wireless network for students and lecturers interaction. The study deployed a survey methodology to evaluate and measure the implementation of various services and convergence of communication technologies for retrieving and sending information between students and lecturers. It intends to determine which communication technologies and services will achieve the highest level interaction in Malaysian higher educational institutes. Internet technology has become an important educational technology and tool for developing higher education in accessing information (Li & Sun, 2004); (Oliver, 2002). Future users will use more than one device that is capable of gaining access to the Internet. Moreover, in the future, with the integration of data and communication services, almost every ‘Internet Ready’ device will be a communicable device. With the availability of this infrastructure, users are now demanding and expecting more services (Thai, et al., 2003). The convergence of communication technologies and applications is driving demand for new and innovative communications services that supports communication, technology and media (Tunzelana, 2002). For example, in the City University of New York, LAN infrastructure on all the campuses has been upgraded from 100 Mbps to a fully redundant and scalable 1 Gbps backbone. The SNet model development is used to provide a total end-to end e-service to students and lecturers. This model is to leverage existing infrastructure, add enhanced services and support the total infrastructure (Padmanabhan, 2003). Many new services have emerged to realize ubiquitous computing environments, owing to the increasing supply of mobile devices and more widespread Internet and wireless network facilities. Students, professors, school staffs, and campus visitors can easily access the various available campus services by using image-based sensors and mobile devices such as CDMA cellular phones or WiFi smart phones (Melazzi, 2005); (Bigioi & Corcoran, 2002); (Han, et al., 2004). With the availability of Internet infrastructure, users (students and lecturers) are now demanding and expecting more services. Users (students and lecturers) will use more than one device that is capable of gaining access to the Internet (Reynolds, 2003). Users can get the information content they want, in any media, over any facilities, anytime, anywhere (Crimi, 2002). Convergence is pushing towards an environment that requires new investment in infrastructure to support the delivery of rich services (various services), applications and content for students and lecturers. 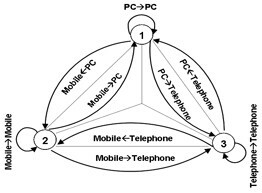 For example, using computers to phone, browsing websites with cellphones or reading emails on TV screens illustrates the idea of convergence (Jiang, et. al, 2003), (Podhradsky, 2004). In the 21 century, a network infrastructure is based on multi-service implementation over convergence of network medium such as ISP, PSTN and GSM (Qigang, et al., 2005). Availability of multi-service has produced multi-traffic in network infrastructure. Therefore, multi-traffic in the network infrastructure has become more complex to observe and analyze (Kyung-Hyu, et al., 2003); (Jiang, et al., 2003). Today, retrieving and sending information can be done using a variety of communication technologies such as PC, PDA, fixed and mobile phones that are more prone to hetergenous environment, but unfortunately the optimal capability of communication technologies are not fully realized. 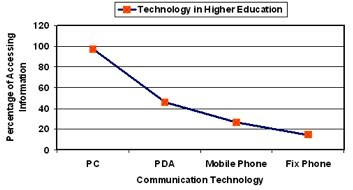 PC technology is more often use in retrieving and sending information between students and lecturers compared to other communication technologies (Reyes, 2003). The main factors of network congestion in higher education are related to network design and bandwidth capacity (Gerhan & Mutula, 2005) that can affect students and lecturers interaction. Nevertheless, few studies have been conducted to evaluate the application of computer network technologies and services over heterogeneous environment in higher education institutes. Therefore, retrieving information and interaction over heterogeneous environment using convergence of communication technologies between students and lecturers in Malaysian higher educational institutes should be analyzed and evaluated. The study deployed survey methodology to evaluate and measure the implementation of various services of communication technologies for retrieving and sending information among students and lecture. Malaysian higher educational institutes were selected because, to investigate the pattern of network infrastructure that has build based on multi-service implementation over convergence of network medium such as ISP, PSTN and GSM in the 21 century. This survey was conducted in January 2006 in several Malaysian higher educational institutes (refer to Table 1). Research procedures in higher educational institutes consist of (i) identify research questions; (ii) construct research instrument; (iii) identify sample frame; (iv) collect data from the respondents; (v) evaluate and measure the data and; (vi) validate and analyze the data. The questionnaire comprises four categories: (i) general information; (ii) network infrastructure; (iii) communication technologies and services; and (iv) Quality of Service (QoS). Figure 1, shows the data collection process, validate and analysis in this study. Impact and performance analysis of heterogeneous environment implementation will be divided and discussed in three areas: (i) analyze availability of bandwidth for network infrastructure; (ii) analyze implementation of various services and communication technologies over heterogeneous environment; and (iii) analyze implementation of QoS for heterogeneous environment. Frequency test was used to analyze and measure availability of bandwidth speed for network infrastructure in higher educational institutes. Figure 2 shows that implementation of 2 Mbps (low speed bandwidth) has achieved higher percentage than 20 Mbps and above (high speed bandwidth) in Higher Educational Institutes. While, it also shows that LAN speed bandwidth is more focusing to 100 Mbps implementation compared to 1 Gbps (see Figure 3 and Table 2). Frequency test has show decreasing of graph in exponential pattern for Internet bandwidth implementation from low speed bandwidth to high speed bandwidth. 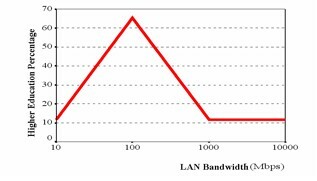 T-test was used to test hypothesis for implementation of bandwidth capacity. By using t-test, the result shows that implementation of high speed bandwidth for Internet (WAN) achieved significant level as compares to LAN. From the result, it shows that there is significant difference regarding the implementation of high speed bandwidth for Internet (WAN) in Malaysian higher educational institutes. However, implementation of high speed bandwidth for LAN among public and private higher educational institutes did not show any significant difference and it has a similarity and focusing of high speed bandwidth implementation 100 Mbps (see Table 3). Frequency test was also used to analyze the implementation of various services and technologies in higher educational institutes. 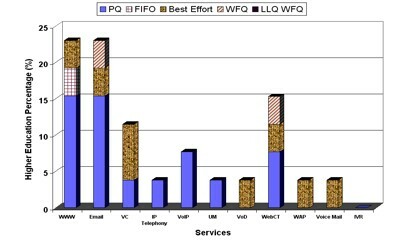 Figure 4, shows the result of various services implementation such as Web and Email services achieve higher percentage (100%) as compared to other services such as Video Conference, Voice Mail, WebCT, VoD, IP Telephony, VoIP, Unify Messaging, WAP and IVR (20% and below). Therefore, retrieving information and interaction between students and lecturers in Malaysian higher educational institutes used mainly Web and Email services. A heterogeneous network campus environment provides user (student and lecturer) mobility, as students and lecturers are no longer tied to fix locations to access the information and interaction. It also offers high network accessibility as network resources remain accessible after office hours. Students and lecturers of WAP, IVR, voice mail, VoIP and IP Telephony services will benefits from easy to relevant campus information through their portable devices (mobile phone and PDA). Table 4 and Figure 5 show the impact of various services operational on convergence of communication technologies utilization for retrieving and sending information between students and lecturers. The result also shows decreasing use of communication technologies such as PC, PDA, Mobile Phone and Fixed Phone in accessing information and interaction among students and lecturers which is less than 10%. Figure 6 shows the percentage of each communication technology in accessing information in Malaysian higher educational institutes. The most popular communication device used by students and lecturers for accessing information is PC technology (100%). While, Mobile and Fixed Phones (20% and below) are the lowest communication technologies used by students and lecturers for accessing information in Malaysian higher educational institutes. Figure 7 shows communication flow of devices (portable and non-portable devices) that communicate with each other (students and lecturers) for accessing information in Malaysian higher educational institutes. It indicates that Malaysian higher educational institutes did not achieve optimal performance in heterogeneous environment. This heterogeneous environment is designed to facilitate students and lecturers interaction, provide broadcast information and ease collaborative work through the use of portable devices such as mobile phone and PDA. Low speed bandwidth implementation for Internet connectivity (refer to Figure 2) can contribute higher bandwidth utilization. 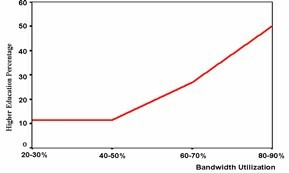 Figure 8 and Table 5 show that the majority of the higher educational institutes have obtained higher bandwidth utilization (80% to 90%). A few of Higher Educational Institutes (10%) has not fully utilized the bandwidth utilization (20%-30%). Due to high bandwidth utilization, it can degrade the network performance on operational services such as Web and Email traffic congestion (see Table 6). 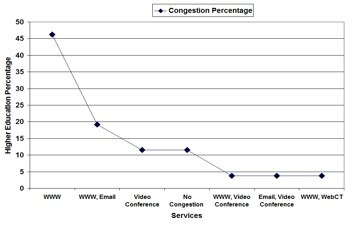 Web and Email services contribute to 66.4% of the network traffic congestion (see Figure 9). 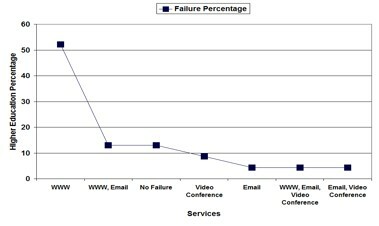 Web service contributes to 50% of the network failure (see Figure 10). Today, higher bandwidth utilization in higher educational institutes can impact the heterogeneous network environment performance. From the data analysis, it shows accessing information and interaction among students and lecturers in higher educational institutes are under utilized based on the implementation of various services and convergence of communication technologies. Today, base on the survey result, implementation of heterogeneous environment in higher educational institutes will be occurred of performance issues because the higher of network utilization traffic and lowest usage of bandwidth link to Internet. Therefore, the efficency of the heterogeneous environment in higher educational institutes can quickly deteriorate when the number of students and lecturers increases over the Internet. In addition conversation between two parties (students ßà lecturers) will be unreliable, inconsistent and unsatisfactory. The challenges in deploying heterogeneous environment in higher educational institutes are mainly from issues related to the network congestion and this will affect the bandwidth link quality. Implementation of heterogeneous environment will create a new era to communicate between students and lecturers over various services and technologies. If Malaysian higher educational institutes want to develop heterogeneous environment, it needs to ensure that capacity, utilization and service of network are well managed. This problem can be solved if System Network Administrator is able to evaluate and measure the network performance in early stage (preparation, planning and designing) before implementing of various services over heterogeneous environment. Therefore, it needs a mechanism or model to evaluate and measure network performance in early stage. 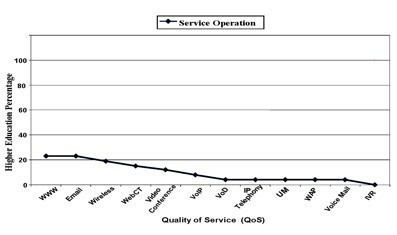 Impact of low service operations in higher educational institutes also affects the implementation of QoS (see Figure 11). The result also shows decreasing exponent pattern for QoS implementation. To ensure that current services can operate more efficiency, system network administrator preferred to use ‘priority queuing’ (see Figure 12). Based on the respondents’ comments (refer to Table 7), the result shows that few expert workers is the main factor why Qos is not implemented in higher educational institutes to improve the operational services performance. From the survey results, it shows that Malaysian higher educational institutes have not achieved maximum level of various services implementation via convergence of communication technologies for retrieving and sending information between students and lecturers. Furthermore, Internet bandwidth connectivity implementation is more focusing on low speed bandwidth (2 Mbps) compared to high speed bandwidth implementation. 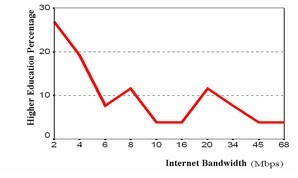 Low speed bandwidth can affect the bandwidth utilization in network infrastructure. In addition, the survey also indicates a minimum QoS implementation in higher educational institutes. Web and Email services have contributed to higher network congestion due to high utility. To ensure that other services e.g. video conference, video on demand, VoIP and IP telephony can operate without any interruption, the higher educational institutes should have high-speed bandwidth and good QoS implementation. The most significant finding in this study is to show that accessing information over heterogeneous environment in Malaysian higher educational institutes is still under utilized. 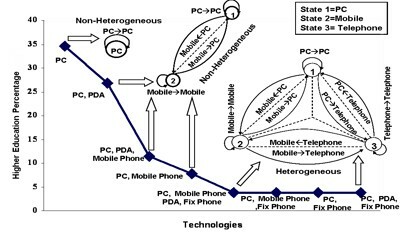 Based on the findings of this study, I have conceived a new comprehensive communication flow framework of devices and taxonomy, which allows us to categorize heterogeneous environment (see Figure 13). This framework suggests a low mobility and ubiquitous computing environment between students and lecturers in Malaysia higher educational institutes. In addition, convergence of communication technologies aims to enhance various services implementation for accessing information in higher educational institutes. 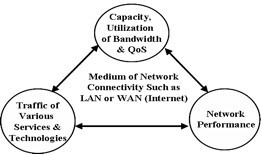 Figure 14 shows how the relationship between network performance, multi-traffic, bandwidth capacity, utilization and QoS can affect network connectivity such as LAN or Internet (WAN) over heterogeneous environment. If Malaysian higher educational institutes are planning to develop heterogeneous network environment, they need to ensure that bandwidth capacity, bandwidth utilization and QoS of network are well managed for multi-service traffic. Heterogeneous environment can also generate mobility approaches for accessing information (see Figure 13). To ensure the successful implementation of heterogeneous network environment, the system administrators need to understand current traffic characteristics of the various services. Measuring bandwidth utilization and bandwidth capacity performance before deployment of new heterogeneous network environment can aid correct redesign and configuration of traffic prioritization in network infrastructure (see Figure 14). Future work is to develop a conceptual framework for heterogeneous model as a platform to combine various services implementation and convergence of communication technologies in higher educational institutes. This model can assist system network administrator to analyze computer network performance more effectively and efficiently in designing network topology over various services implementation using heterogeneous model. This futuristic model can help system network administrator to evaluate capability of network performance on preparation, planning and designing stage. It can also improve and obtain high on efficiency network and technical aspects in contributing the robust network architecture. Anand Padmanabhan. 2003. “The SNet model: access, security and e-services for students”, Proceeding of the 13 st annual ACM SIGUCCS conference on User services., San Antonio, TX, USA: pp. 182-188. Assistant Sectary Cecilia V. Reyes. 2003. “Philippine Case: Capacity Building in I.T Sector”, International Symposium on Bridging the Digital Divide in East Asia, Seoul, Korea. Binh Thai, Rachel Wan, Aruna Seneviratne & Thierry Rakotoarivelo.2003. “Integrated Personal Mobility Architecture: A Complete Personal Mobility Solution”. Kluwer Academic Publishers. Bigioi, P. & Corcoran, P.M. 2002. “Platform and network independent multimedia services. Consumer Electronics”. ICCE. Digest of Technical Papers. International Conference, pp. 86 – 87. David R.Gerhan & Stephen M. Mutula. 2005. “Bandwidth bottlenecks at the University of Botswana”, Published by Emerald Group, Vol. 23 (1), pp. 102-117. J.C. Crimi. 2002. “Next Generation Network (NGN) Services”, Telcordia Technologies. Advanced Learning Technologies, Proceedings. IEEE International Conference, pp. 993 – 997. Kyung-Hyu .L, Kyu-Ok .L, Kwon-Chul .P, Jong-Ok .L & Yoon-Hak .B. 2003. “Architecture to be deployed on strategies of next-generation networks”, Communications ICC '03. The IEEE, Vol. 2, pp. 819 – 822. Melazzi, N.B. 2005. “The Simplicity Project: Improving Ease of Use and Personalization of ICT Services”.Wireless On-demand Network Systems and Services, WONS 2005. Second Annual Conference, pp. 174 – 179. Podhradsky, P. 2004. “Migration scenarios and convergence processes towards NGN (present state and future trends)”, Electronics in Marine Proceedings Elmar. 46th International Symposium, pp. 39-46. Qigang Zhao, Xuming Fang, Qunzhan Li & Zhengyou He. 2005. “WNN-based NGN traffic prediction”,ISADS 2005. Proceedings Autonomous Decentralized Systems, pp. 230-234. Ron Oliver. 2002. “The role of ICT in higher education for the 21st century: ICT as a change agent for education Edith Cowan University, Perth, Western Australia”, HE21 conf. Proceeding. Sibongiseni Tunzelana.2002. “An Investigation into the Convergence of Information Technology Telecommunication and Media in South Africa”, Proceeding of SAICSIT 2002, pp. 259. Tack-Don Han; Cheolho Cheong et. Al. 2004. “Implementation of new services to support ubiquitous computing for campus life. Software Technologies for Future Embedded and Ubiquitous Systems”, Proceedings. Second IEEE Workshop, pp. 8 – 13. Xianxin Jiang, Fangchun Yang & Hua Zou. 2003. “A novel architecture to customer service management for the NGN”, ICCT 2003, International Conference, Vol.1, pp. 123-126.